It seems like life continues to be a series of small projects to accomplish, lately. Maybe that's because we've been able to get more things done with organization and unpacking all the million boxes we had, many of which were and still are marked "Decor". eeeck. I try not to overwhelm myself, but plug away at one thing at a time on my long list of "need to do". One of those projects has been getting a couple of tablerunners sewn for the little round table in the kitchen, and then the Dining Room. I actually have my sewing machine set up downstairs. I know...no more excuses for sloppy table runners. This little table has a leaf extension, but without it there is a large "crack" that doesn't meet well where the table joins together. Hubbs has tried to refit it for more stability, but I know it's well over a hundred years old. It's probably closer to 120, so we just try to be mindful that it's a little rickety, and not without flaws. from Decor Steals I think, but this image came from Farmhouse Wares. I bought one that's shown above, and then another time bought the flax with a black stripe that you can see below. 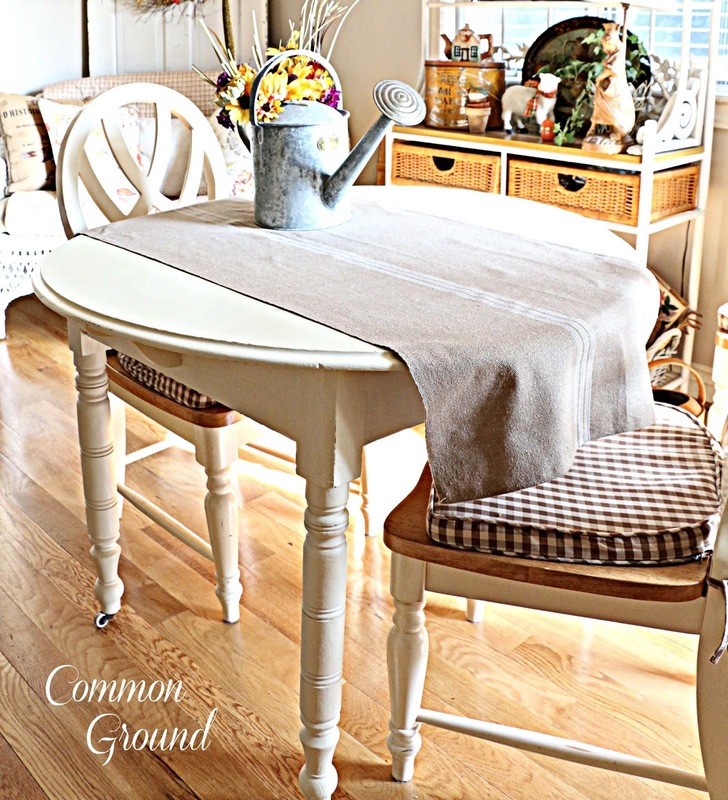 I used it as a tablerunner for my Dining Room table in the Fall. It's 54 inches wide so I just folded it in half. out of each of the pieces of the fabric. it actually is more like a heavy linen, than grain sack. when it's closer to Halloween and Thanksgiving. and I'm trying to walk the line to keep it from looking like a chain store aisle. so I'm trying to restrain myself. and little projects I'm doing each week. I don't have a lot of "Reveals" up my sleeve. and actually that's just the way I like it. Nice! Love your comment on the chain store aisle, but I don't think you have a thing to worry about. It looks great, and I will always think of you as fall approaches, and while fall is here, knowing how much you love the season. 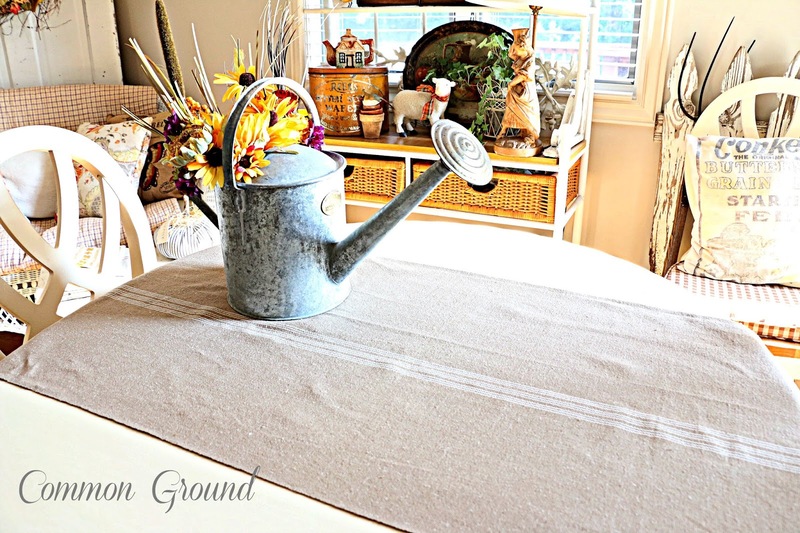 Love your table runners. Look great! It's lovely, Debra! And I LOVE your sheep vignette! 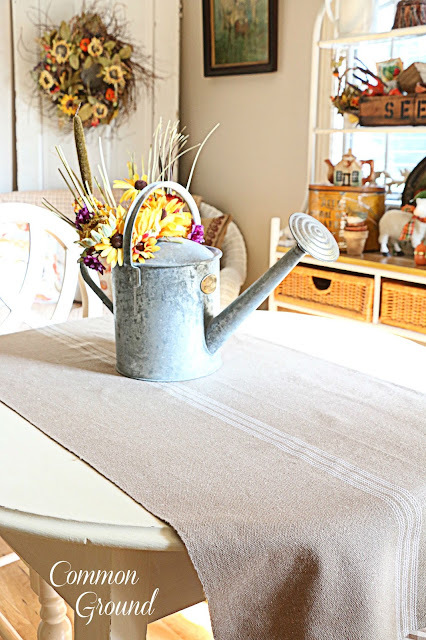 Lovin' your table runners and I too, LOVE the Fall season. 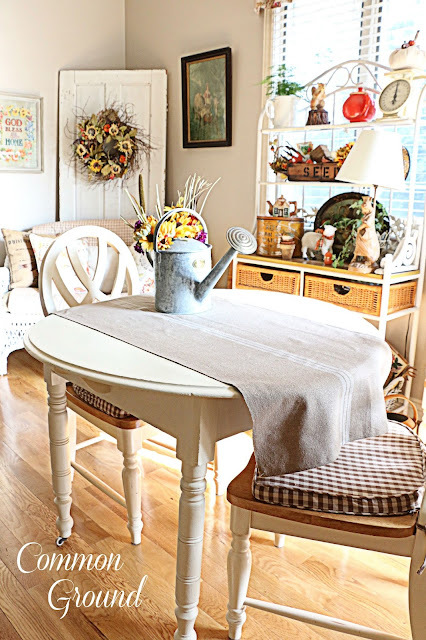 I love the grain sack fabric from Decor Steals. It looks great as a table runner and goes so well in your home. I really believe the secret to Fall is texture, and these linen/feedsack cloths are a prime example. Just like nubby throws, and plaid blanks…we want to cozy up…and let our tactile and visual senses soak in the warmth of the coming season, with Beaufort with his plaid necktie, lurking in the background. Now for a pumpkin spice latte! That is darling fabric and I love the touches of fall that I spy. I bought that same fabric, Debra! I think I got three, as well, when whoever it was had the offering for it. They make for great table runners. I still have quite a bit of it left and have been debating what I want to make with it. I'm thinking of a pillow cover for a lumbar I have on our sofa and possible some Christmas stockings. So pretty, Debra...I always love your fall decor! I love the runner! I think your centerpiece is a nice transition into Fall... Looks great! I agree... The one with the black stripe would look good for Halloween! Beautiful table runners Debra! I purchased some of the same grain sack inspired fabric from Decor Steals for a special project. 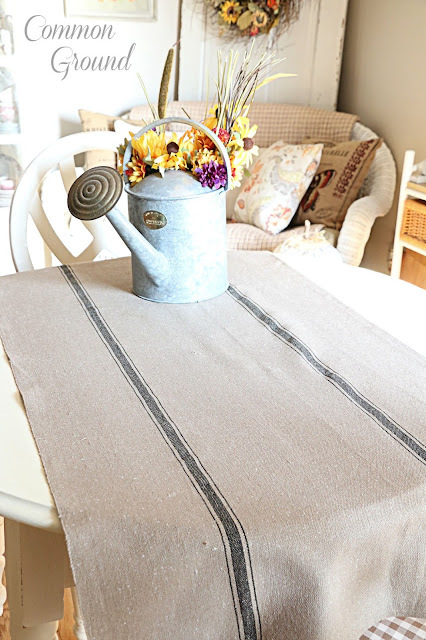 If I have any left over I will definitely make one of these table runners. I found your blog via "The Scoop" link party and have enjoyed browsing around your site. I believe each season has something special to offer, but Autumn is definitely my favorite, so I completely understand your enthusiasm for fall decorating. I love that fabric! I've often thought about buying some of it myself. I like how you used it for a table runner. I laughed when you said that you were going to try to restrain from making your home look like a chain store aisle. Too funny! I know sometimes it's easy to do when you like a lot of stuff. I think we've all been there. I love how pretty your table runner looks in your dining room. Hi Sweetie! Girl, I just love how you do what you do!! The tables runners are awesome! 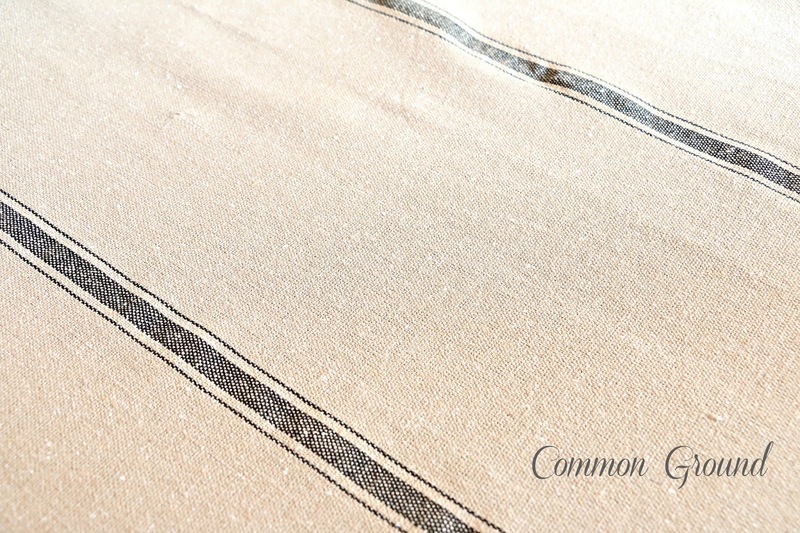 I have a caramel striped grain sack I need to make into a runner! I am always so inspired when I visit! I love your runners, Debra! I have runners and pillows from the antique hand woven fabric, and there really is nothing like it. It's beautiful, and very, very sturdy. 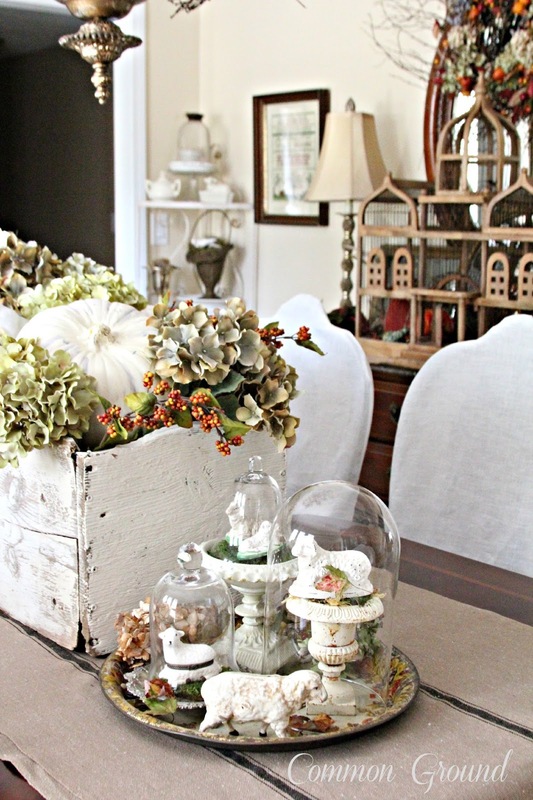 Love your fall touches! I love your old new grain sack runner, I have been wanting to do up more pillows and you are starting a fire under me to get back sewing... The Christmas stocking I sewed up during the heat of summer has zapped the sewing life out of me, all the inside outing and sitching the little rings to them makes you not want to look at a sewing machine for awhile. I have always been in awww! Of your seasonal decor, and here it starts with visits to your home blog that welcomes each and every season and holiday in perfect style. I love that fabric! I bought a yard of the blue and it's sort of hiding the back of my dated wingback chair. It's looking like fall at your house! 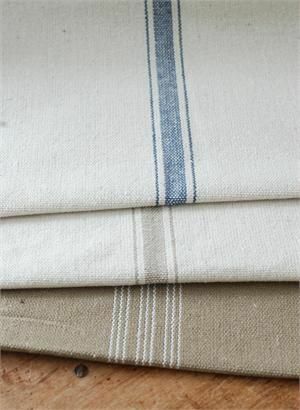 Your linen ~ grain sack runners are lovely, dear friend!!! I adore the softness they bring!!! I was so~o~o glad that I had $old all of the plastic pumpkins early!!! I don't have "tons" of decor, but I love the pieces I kept!!! No big 'reveals' here on my side of the Prairie, either!!! Your smaller table and two chairs speaks of the importance of "love"
and togetherness within your home!!! The table runners do look like grain sack! 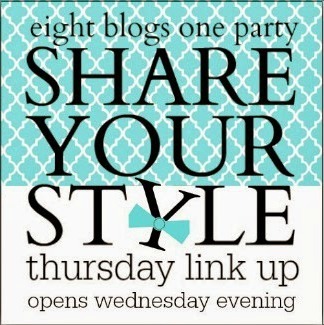 Very cool idea, and they look so lovely! 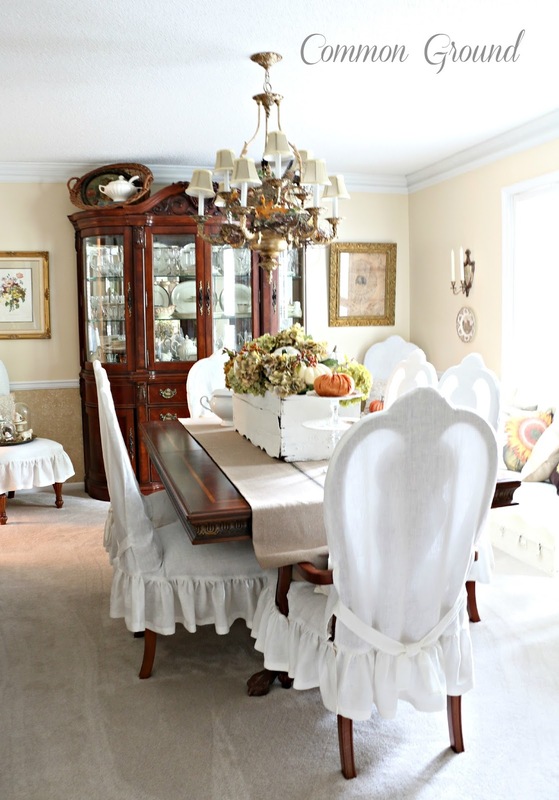 I really love the slipcovers on your chairs too!